Academy Award winner Angelina Jolie directs and produces "Unbroken," an epic drama that follows the incredible life of Olympian and war hero Louis "Louie" Zamperini (Jack O'Connell) who, along with two other crewmen, survived in a raft for 47 days after a near-fatal plane crash in WWII—only to be caught by the Japanese Navy and sent to a prisoner-of-war camp. 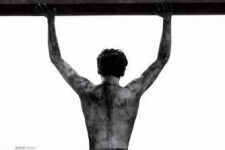 Adapted from Laura Hillenbrand's ("Seabiscuit: An American Legend") enormously popular book, "Unbroken" brings to the big screen Zamperini's unbelievable and inspiring true story about the resilient power of the human spirit. Starring alongside O'Connell are Domhnall Gleeson and Finn Wittrock as Phil and Mac—the airmen with whom Zamperini endured perilous weeks adrift in the open Pacific—Garrett Hedlund and John Magaro as fellow POWs who find an unexpected camaraderie during their internment, Alex Russell as Zamperini's brother, Pete, and in his English-language feature debut, Japanese actor Miyavi as the brutal camp guard known only to the men as "The Bird."